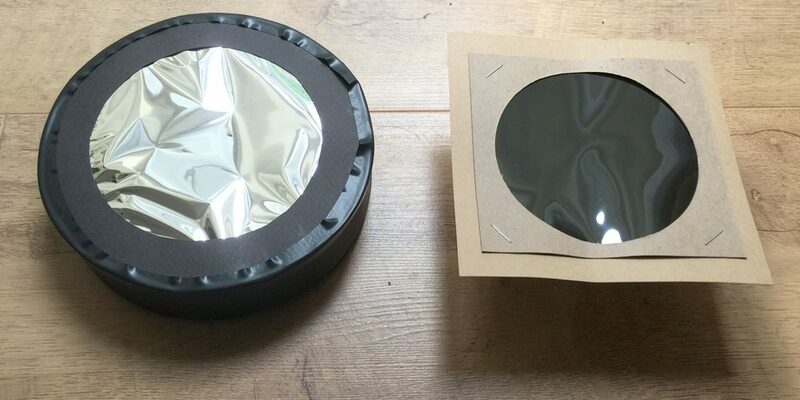 There are two popular kinds of inexpensive solar filters which you can buy in unmounted sheets, cut them and mount them yourself. The older kind is the black polymer type, with the most famous kind (especially in the US) being the one that Thousand Oaks makes (their glass filters are also popular), while the currently more popular (at least in Europe) type is Baader’s Astrosolar safety film. I have used the Baader film for a few years, but thought I’d give the Thousand Oaks a try in case it gives me something the Baader does not. You can get the Thousand Oaks filter directly from the US manufacturer, or you can find a bit cheaper sheets on amazon.co.uk, amazon.com or ebay (starting at around $15/£14 for a 6″x6″ sheet). The Baader film can also be found on amazon.co.uk, amazon.com, FLO and ebay with prices starting at around £20/$37 for an A4 sheet. Be careful, we are talking here about the “visual” (ND=5.0) Baader film, as there is also the photo version (ND=3.8) which is only for high-power photo use (or visual with narrowband filters) – for a test with that filter check here. Both materials are relatively easy to cut with scissors. Don’t worry if the baader film looks crumbled when you mount it, you are not supposed to tighten it, that’s how it should be. The black polymer seems like a tougher material, but as I’ve never had the Baader tear on me with some reasonable handling, I wouldn’t say it is too sensitive. It is always recommended to check your filters for holes before your session in any case – this particular Baader hasn’t developed any in the 3-4 years I’ve been using it. The Baader film gives you a neutral white color. Although it seems a bit “unnatural” to most, it is, in fact, the actual color of our Sun – daylight is white indeed. The black polymer gives a warm orange color, which might not be “correct”, but as it looks a bit like a setting Sun, it is appealing to many observers. However, the black polymer is much darker as well, you will notice from the camera settings about 16x times more light passes through the Baader film just in the yellow-red spectrum, even more in the green-blue. The result is that the Thousand Oaks filter feels a bit too dim on small apertures, from my experience to enjoy a bright full solar disk you’d need about 4 inches aperture or more for higher magnifications. What’s worse for the black polymer is that apart from dimmer the image is also less clear. In fact, on the 80 ED you can easily tell the difference in detail even at low magnifications, while on a 4-inch or larger aperture at least when viewing the full disk the black polymer looks sharp as well and you have to increase magnification to tell the difference. I think it is clear from the above quick write-up that there really is no reason to choose the black polymer filter, especially if you have a small scope, or are interested in photography, or are after high magnification detail views/photos. 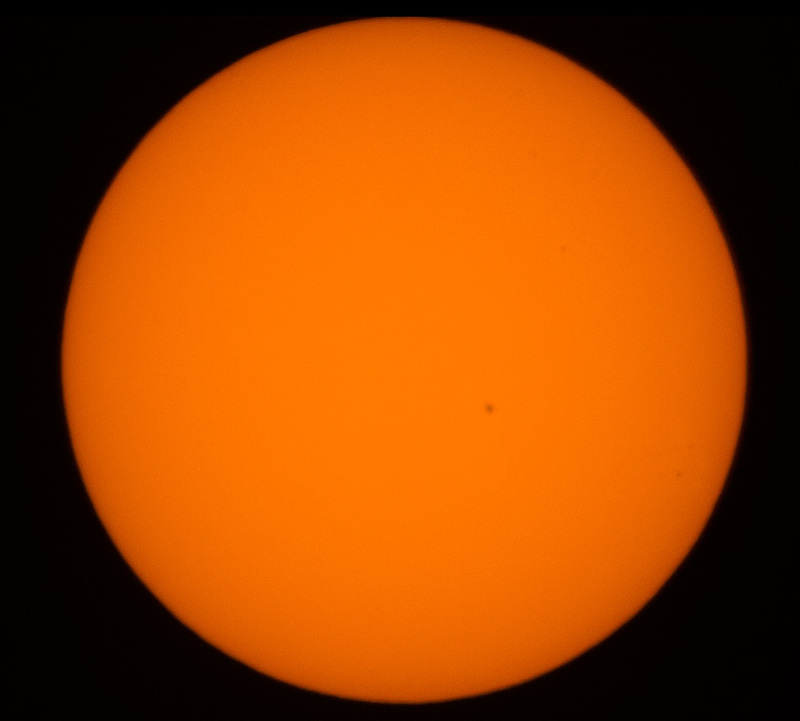 Sure, the orange color is a bit more pleasing for some, as it reminds you of a “sunset” Sun, but for just a bit higher price the Baader will give you clearer, brighter views or photos and can be combined with various other filters. If you want high magnification photography of the sun, take a look at my Astrosolar ND3.8 photo film review. Note that Thousand Oaks has released a couple of newer filters since this write-up, for which I can offer no comment as I haven’t seen them in action. I notice the thousand oaks is black and doesnt have the silver reflection coating as the baader in your photo. Just purchased a sheet of thousand oaks solar film and it has one side with silver. Im wondering if thousand oaks has improved there solar film since your test? Hello. The one I tried is the Thousand Oaks “Black Polymer”. I see that they now have two new filters, the “silver-black” (which is probably what you have) and the “Solarlite”. I have not tried either so I can’t tell you for sure, but I assume they are improved, perhaps I will try them in the future. 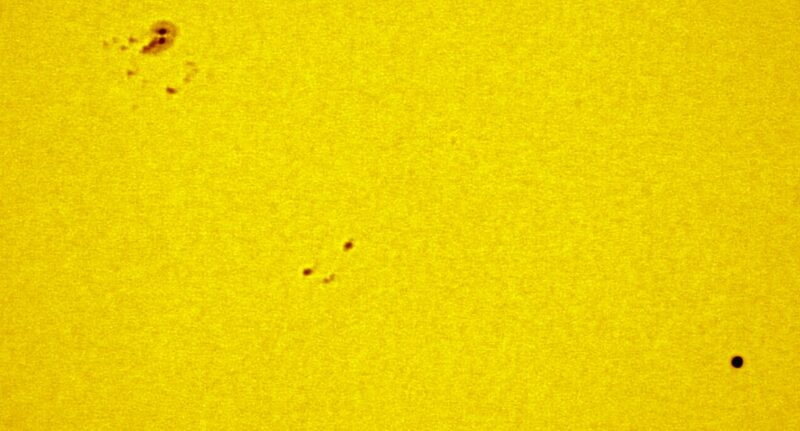 It will be hard for them to beat the Astrosolar film though, as I see they are still yellow/orange filters when the most useful filters to enhance details are green, which require a neutral-color solar filter. I need enough black polymer to make a solar filter to go over the open end of an Orion SkyQuest XX16g GoTo Truss Tube Dobsonian Telescope. to view the eclipse. It’s a 16 inch telescope, as if you didn’t know. Not sure if this is a question – I have no relation to any retailer, however Thousand Oaks has a newer filter called Solarlite which should be better than their old black polymer, although I don’t know if it is as good as the Baader Astrosolar. I see it comes up to 14″, which is plenty you really don’t have to have the full aperture, in fact you might get great results if you do something like a 6″-7″ of clear aperture – i.e. avoiding the secondary and its support vanes, so off-axis, just make sure the rest of the aperture is safely blocked. If you still wanted 16″ for the heck of it, Baader Astrosolar has you covered as you can get a 1mx0.5m sheet (that’s about 40″x20″) at almost half the price of a 14″x14″ Thousand Oaks, and it will probably be sharper (but white, i.e. the Sun’s actual color). I found this to be of great help. 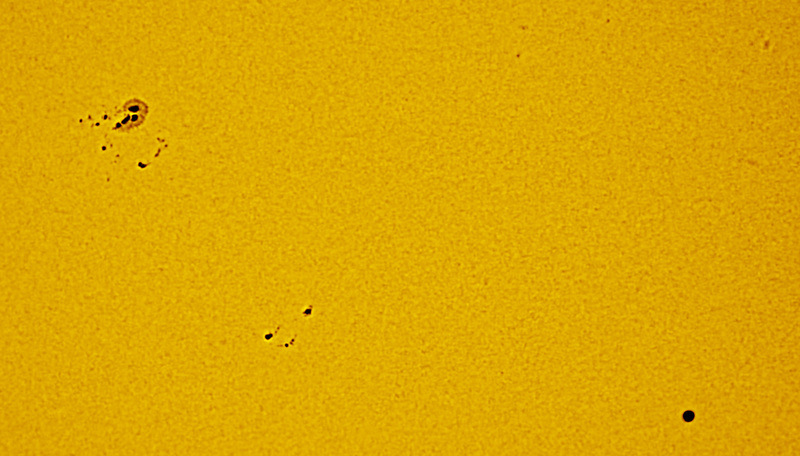 I just ordered Baader Astrosolar for my 95mm lens. Looking forward to this. I want the picture with the most clarity and this would seem to be the best option. If I want to go into post and change it to orange later on , that would not be a problem. You’re welcome and I hope you enjoy the filter! What is the best way to cut the black polymer from Thousand Oaks into a circle? Did you trace it out with a needle or marker and then freehand cut with scissors? I just cut it square with scissors. If I had used a cylindrical mount like I did with the baader, still I would first cut roughly a square generously covering my aperture and then just clip the excess after mounting it. I don’t see a need to ever cut it in a circle, you are never trying to get exactly the circular aperture of your scope, you are trying to cover a little more to be safe.